Relax your shoulders. To do this it is often easier to imagine you are increasing the distance between your ears and your shoulders. Let your shoulders move downwards and slightly backwards but be careful not to force this movement. Breathe normally and close your eyes. Keeping your lips lightly sealed, breathe in through your nose and then breathe out making the sound of the letter ‘M’ (a humming sound), until you need to breathe in again. The longer you sustain your ‘bee hum’, the more relaxing bee breath pose is likely to be. However, forcing the breath beyond your capacity can have the reverse effect, causing even more stress. Therefore, only do bee breath for as long as it is comfortable. 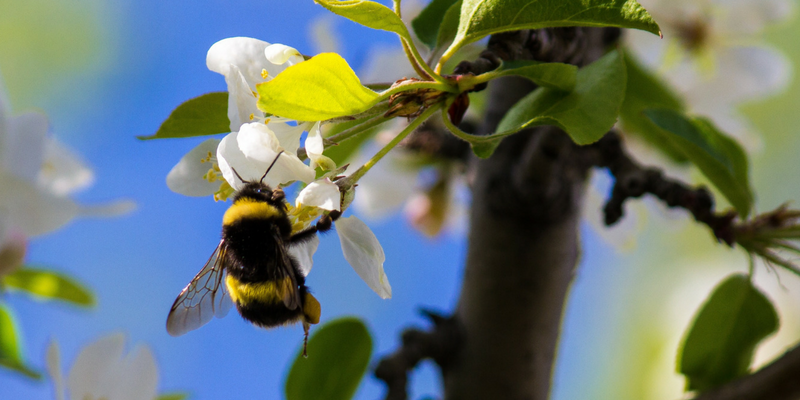 With your eyes still closed, repeat this buzzing bee breathing pattern for a few minutes, or less. Just hum for as long as it feels good. To make the sound feel more ‘intense’ you can put your hands over your ears whilst you do the hums. Finally, spend a few breaths sitting quietly and seeing if you notice a change in your mood – hopefully you should be feeling calmer! 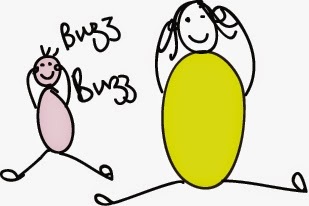 Now encourage your child to ‘buzz’ along with you! Once they have the idea of buzzing, see if your child can put their hands over their ears and try buzzing again. Ask your child if the buzzing seems louder or softer? Does it feel nice? Remind your child not to do more than 3 breaths in a row, otherwise they may feel dizzy! Research highlights the powerful effect a child’s cry has on most adults, regardless of whether they look after children or not. Areas in our mid-brains associated with the ‘fight, flight & fright’ response are quickly activated when we hear a baby crying. Men produce more testosterone which can lead to increased stress levels. Interestingly, fathers who are more involved with the care of their baby or child seem to produce less testosterone on hearing a child’s cry. This may mean that they are less vulnerable to stress when coping with a crying child. Women release more cortisol – a hormone associated with the stress response. Researchers suggest that these changes in body state possibly reflect an increased need for our bodies to be ‘ready for action’ and more alert. However, over time, these responses can lead to an increase in overall stress levels. Young children will often respond to ‘increased state of alertness’ by becoming more anxious themselves – breathing quicker and perhaps crying more and so the tension builds. By taking slow breaths in bee pose, your child will be also be encouraged to slow their breathing. As a direct result of taking slower breaths your heart rates will automatically decrease and this will lead to in an increased feeling of calmness between you and your child. 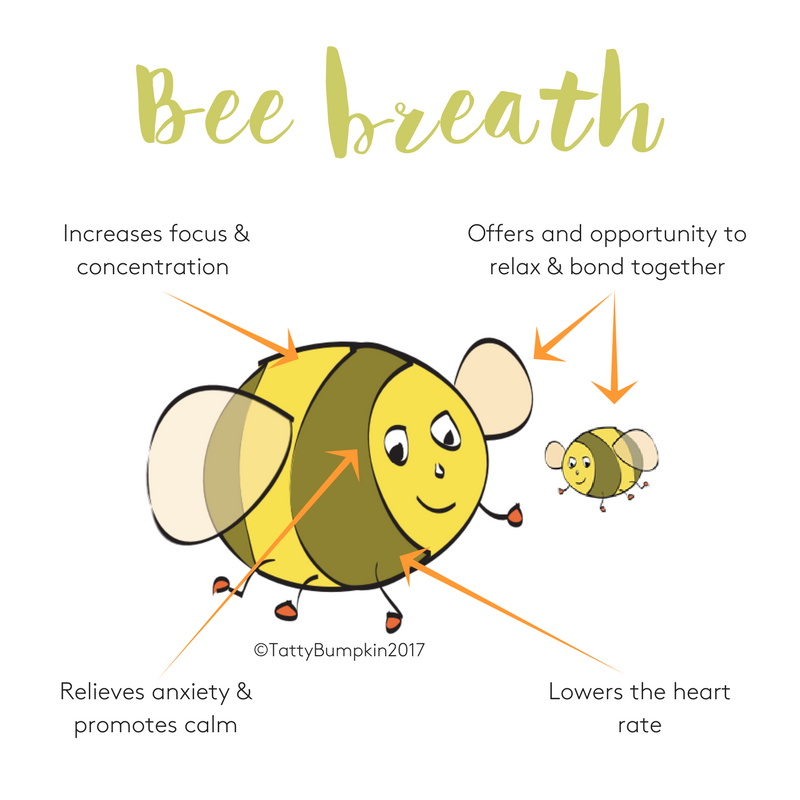 In addition to reducing anxiety, breathing exercises such as buzzing bee breath enable both you and your child to clear your minds. In turn, this improves focus, memory and concentration, helping you to perform better at tasks related to memory and learning, including reading. Bee breath is therefore the perfect activity to try before reading practice, homework or even an exam. By practising bee breath, along with other breathing exercises such as belly breathing and feather breath, your child will be able to calm themselves when they become over excited or over tired. 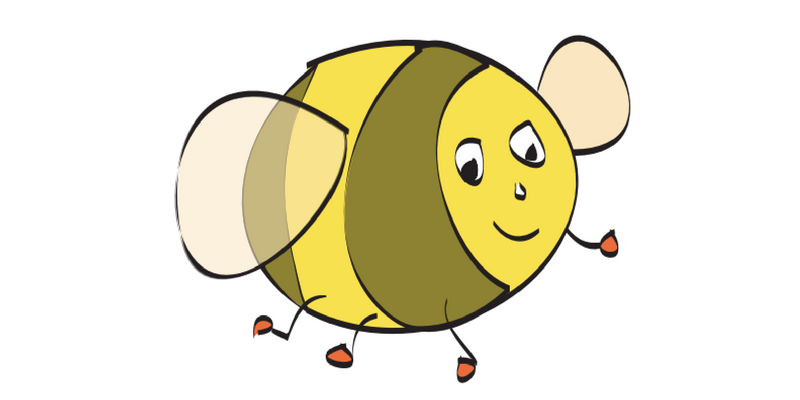 Bee breath allows a child to focus on a task which they find daunting or difficult. Often we find it hard to tackle a difficult task, even as adults, as the anticipation makes us anxious and raises our ‘levels of alertness’ too high for us to think straight. As they slow their breathing and buzz in bee pose, especially with their eyes and ears closed, your child is learning a way to self-regulate their level of alertness, so that they can confidently & calmly approach something new. 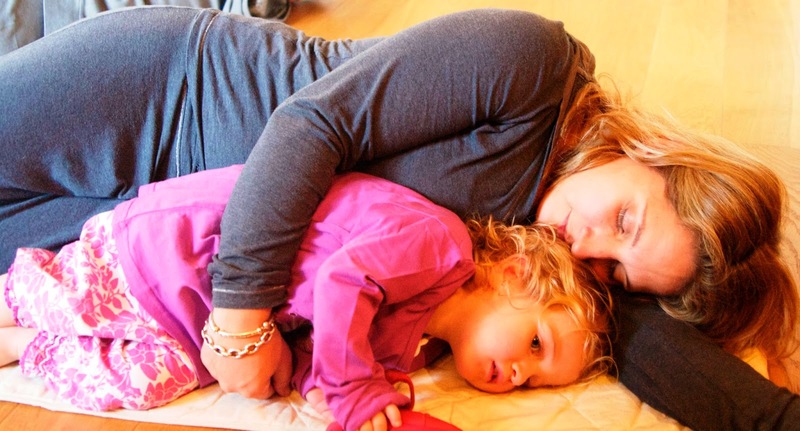 After doing Bee pose with your child, lie down together and listen to the Tatty Bumpkin Bee song. If your child is older they can try ‘bee hums’ with their eyes shut and their hands over their ears. Does the buzzing seem louder like this? If your child is younger, you may need to guide their hands over their ears until they get the idea, then step back and see if they can do the activity by themselves. Do stop your child from doing more than 3 breaths in a row otherwise they may make themselves dizzy. Try doing louder, softer, higher, lower ‘bee hums’ together. Try humming along to a favourite songs or rhyme. This is a great exercise for your child’s vocal chords and speech muscles. You can also try bee pose in lying or standing.